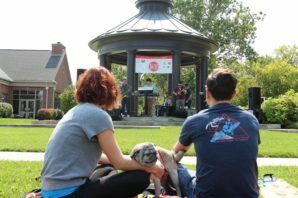 The FREE PBJ & Jazz summer series is pleased to return to the downtown Topiary Park for its ninth season of free outdoor concerts. 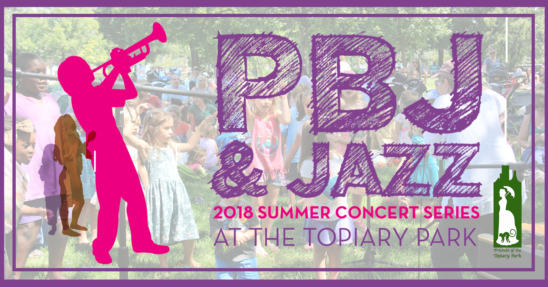 PBJ & Jazz at the Topiary Park: Jazz for Kids and Families is a collaborative effort between the Jazz Arts Group, Friends of the Topiary Park, Columbus Metropolitan Library, and the Columbus Museum of Art. 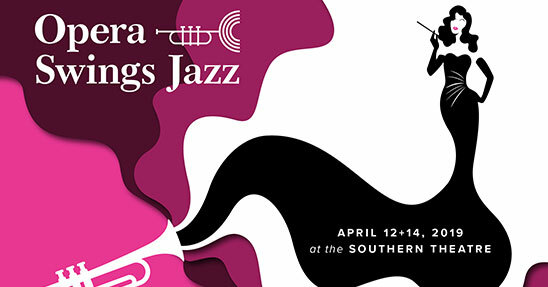 PBJ & Jazz concerts are one-hour long interactive concerts designed to introduce jazz and American music to young children and their families. 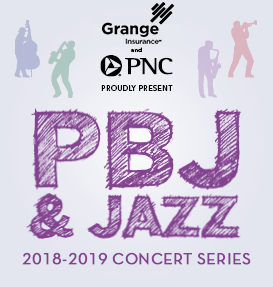 Featuring some of Columbus’ finest musicians and ensembles, PBJ & Jazz concerts are hosted by music educator Rebecca Ogden — and are a great introduction to live music for the youngest audience member. 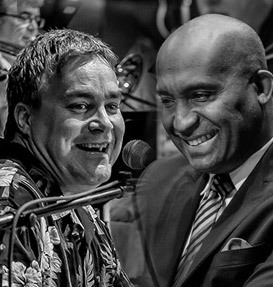 Trio with Renee Dion (August 11th), and Pete Mills Quartet with Rachel Azbell (September 8th). Metropolitan Library. Guests are encouraged to bring a picnic and a blanket to the topiary park. The noon concert will conclude with a hands-on art activity, from 1:00 – 2:00 p.m., presented by the Columbus Museum of Art. The Topiary Park is located at 480 East Town Street in downtown Columbus. In the event of rain, all activities will be held inside the Columbus Metropolitan Library, adjacent to The Topiary Park, at 96 S. Grant Avenue in downtown Columbus. 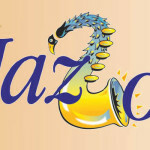 Call 614-294-5200 x 117 or visit www.jazzartsgroup.org for more information. 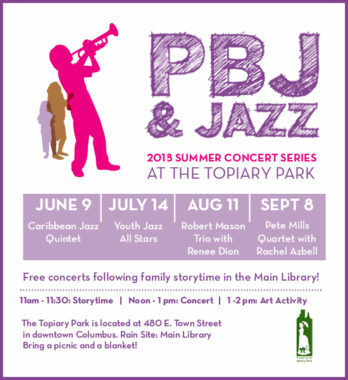 PBJ & Jazz at the Topiary Park: Jazz for Kids and Families is presented by Friends of the Topiary Park and sponsored by the Jennifer Michel Keefer Memorial Fund at The Columbus Foundation and Friends of the Library. In-kind support is provided by Columbus Recreation and Parks. Exclusive media support is provided by WCBE 90.5 FM. 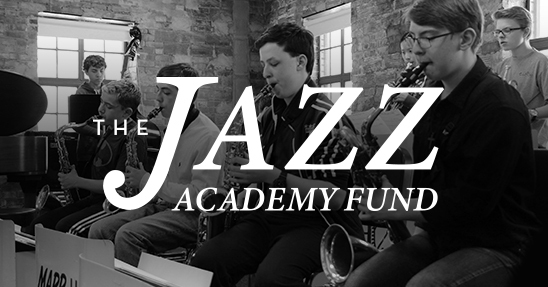 General funding is provided to Jazz Arts Group by the Greater Columbus Arts Council, Ohio Arts Council, and the Columbus Foundation. Established in 1991, Friends of the Topiary Park is a nonprofit organization dedicated to the support and promotion of the Topiary Park. The Friends organize all fundraising and volunteer efforts for garden upkeep, general administrativeduties, running the Visitors’ Center and providing docent-led tours. The Friends have also been instrumental in raising funds to maintain and develop the park’s resources. Friends of the Library is a group that builds awareness and resources to champion Columbus Metropolitan Library’s vitality in the community, funding critical programs such as Summer Reading Club, Homework Help Centers and Teen Read Week. The Friends also support campaigns for the levies which provide public funding for the library. Led by Aaron Scott, a Columbus drumming mainstay, the Caribbean Jazz Quintet will kick off our summer PBJ & Jazz series with the diverse sounds of the Caribbean. 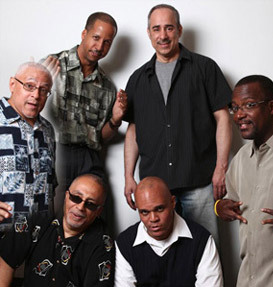 The band will have you dancing from the first beat with infectious rhythms from Cuba and South America. 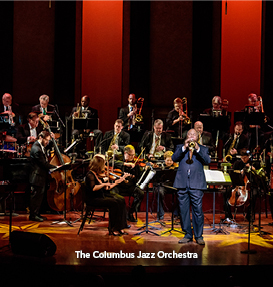 Join Mark Donavan and Ryan Hamilton – Columbus Youth Jazz teaching artists and well-known performers as they lead a group of outstanding students from the Columbus Youth Jazz program. You won’t believe your ears as these talented young musicians blow you away with musical energy! Robert Mason is a pianist and teacher from Columbus, Ohio. His personal ensemble, The Robert Mason Trio, can be heard locally throughout the year where he commits to deliver straight-ahead jazz. This performance features vocal sensation Renee Dion, whose sultry blend of jazz, R&B, hip hop and soul makes her a unique find in a sea of imitators. Columbus is lucky to be home to one of the finest saxophonists around, Pete Mills. His 2014 release, Sweet Shadow, garnered 4.5 stars from Downbeat magazine as well as national airplay. His band will inspire you with swinging, high-energy music, and will feature for this concert Rachel Azbell, one of the most promising young jazz vocalists of her generation.